Look closely at the parking sign outside the LCBO at Rideau and King Edward, and you'll see a small, round sticker affixed to its bottom corner, bearing the image of a smiling donkey. That critter's name is Cargo, and the company is called BrewDonkey, Ottawa's new beer delivery / brewery tour biz that brings the Valley's best craft beer to thirsty folks all over town. 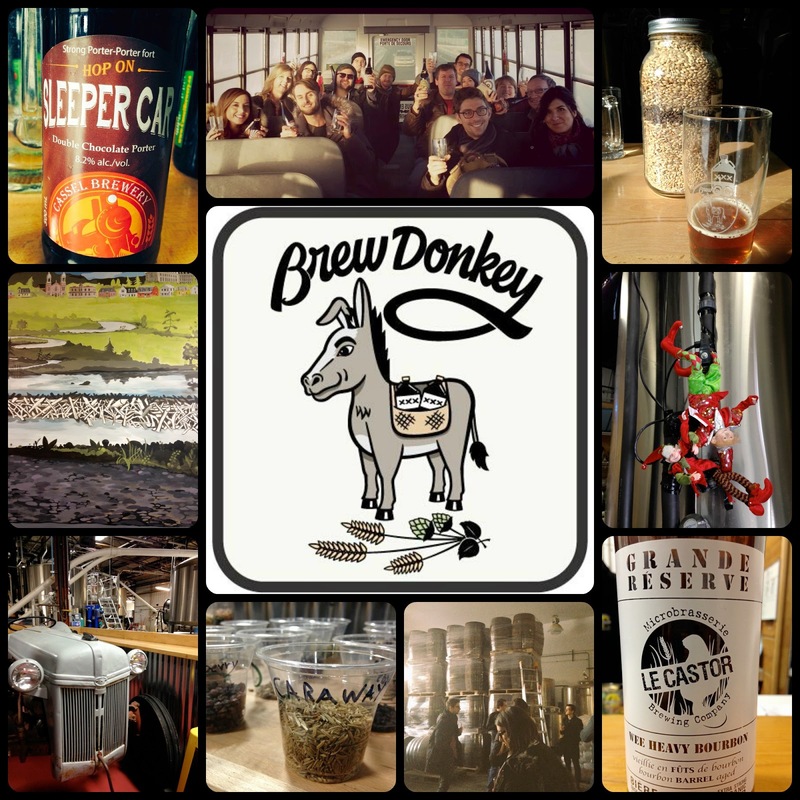 To celebrate a milestone birthday, Hubby and I hopped on board a big yellow school bus and took to the roads with Brad Campeau, the founder of Brew Donkey. We were heading to the east end of the region, with stops scheduled in Casselman, Vankleek Hill, and Rigaud, Quebec. First up was Cassel Brewery, a small get-up smushed in between Casselman's bowling lanes and its VIA rail station. The all-things-railway theme worked well for them, especially when the noon-hour train rolled in, causing the walls to tremble and glassware to clink. Standing huddled in between towering steel vats, we listened to brew master Mario Bourgeois talk about the company's operations while Brad poured out samples. Back on the road to our next stop. Getting out to these far-flung places was a bit of a haul, but we didn't notice, as Brad regaled us with more beer history, science and humour. His lively banter and game-show-host personality kept us happily distracted. We pulled up to Beau's, a large-scale operation in a warehouse that seemed to go on forever, lined with tanks, machinery and its own gift shop stuffed with funky merch. It was busy times at the taps, with a dozen or so beers to try. The eclectic range featured everything from traditional ales to fruit-based gruits and thick porters spiked with peppermint. We stayed there the longest, making several trips to the tasting bar both before and after an educational tour around the premises. Lunch on the go and another long drive brought us just over the Quebec border to Microbrasserie Le Castor. I was struck by the massive mural just inside the front entrance, a depiction of small-town Quebec and countryside, complete with a sprawling beaver dam. Le Castor prides itself in small-batch, barrel-aged special brews and hopped-up IPAs. By then the sun had dipped below the horizon and the cold night had started creeping in. Bellies full and heads a wee bit fuzzy (likely from that Wee Heavy Bourbon) we all curled up on the bus, dozing through the ride home, our own "donkeys" heavily laden with newly purchased brew. Cassel Brewery Golden Rail Honey Brown - Based on a recipe for mead, this one had a rusty orange colour accompanied by aromas of caramel. Creamy head, medium body and slight bitterness on the finish. Cassel Brewery Sleeper Car Double Chocolate Porter - Opaque dark brown, with a nose of coffee, chocolate and licorice. Surprisingly light-bodied for a porter, with just a hint of sweetness, ending with notes of bitter cola. Beau's Bog*Water Eastern Ontario Gruit - Origins of gruit come from early settlers trying to make their spirits-and-water mix a bit more flavourful by adding local herbs, flowers and fruits. End result is a mild, medium-bodied ale with a sweet, floral flavour profile. Beau's Peppermint Porter - Collaborative effort with Big Rig Brewery. Chocolate malt porter spiked with cocoa nibs and real peppermint. Again, for a porter, this is light and fresh, somewhat fruity with a classic candy cane finish. Beau's Burnt Rock Vanilla Porter - My favourite at this stop. All about vanilla bean crème brulée, Mars bar and dark-roasted coffee beans. Heavier than the other porters, a bit more of a digestif or dessert beer for sure. Beau's Hibernal Solstice - Part of the Greener Futures project, this is a members-only specialty done in small batches. The beer is aged in spent wine barrels that impart a noticeable pinot noir-ish funk to the taste. Le Castor Oatmeal Stout - Mealy, medium-bodied with notes of nuts and molasses, drinking strong and hefty with a sharp finish at the back of the throat. Le Castor Wee Heavy Bourbon - This one has serious clout at 11% abv. Aged in spent bourbon casks brought over from France in pieces and then reassembled here. The lingering spirits have blessed the beer with a rich, full flavour reminiscent of apple pie, vanilla, cinnamon and butterscotch. The mouthfeel is pure, smooth silk with nary an aftertaste.